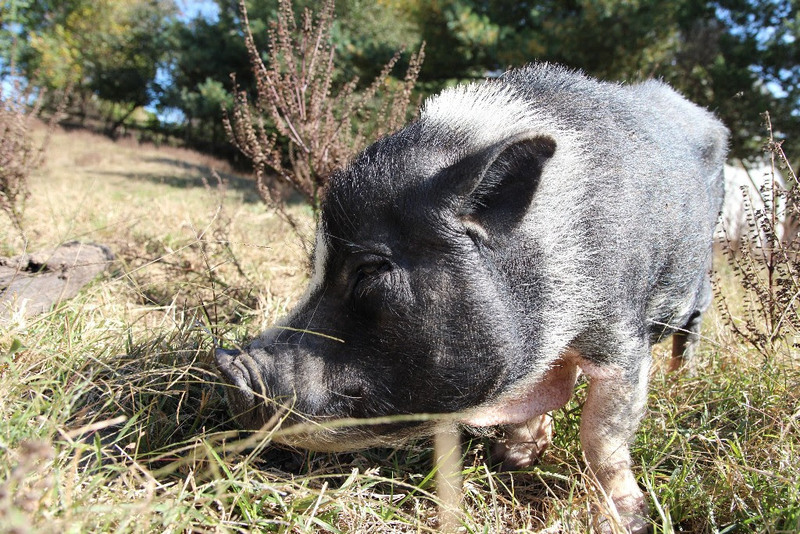 Gladys, the beloved black & white Dowager Pot-bellied Porcine of the manor, transitioned peacefully out of her earthly mud-bound body earlier this month. Her age was unknown, as she never elected to divulge that information and found it rude to discuss. Some sources say that she was, at the very least, 15 years old. Gladys made her way to Chenoa Manor from her original home of Louisiana after being displaced by the flood waters of Hurricane Katrina in 2005. Not being particularly fond of deep water nor having her bristly coat drenched, Gladys was grateful to be removed from the flooded Louisiana front porch where she was tethered during the catastrophic Category 5 storm. She set foot upon the soils of Chenoa Manor a few weeks after the hurricane resolved and never looked back. True to her Southern origin, she was as sweet as summer peaches and as refreshing as sun made iced tea. Gladys was a fan of the cinema and cheered for Sally Field both as the union organizing Norma Rae and again as the Steel Magnolias matriarch. She was also partial to the character of Blanche DuBois in StreetCar Named Desire, though she could not identify with the character’s weakness and flaws. Gladys was preceded in death by her deeply treasured Chenoa Manor partner, Margot, as well as the inquisitively troublesome Hernando. Gladys is survived by her young paramour Gino, as well as her other potbellied friends Eduardo, Beatrice & Berenice. She is also survived by a slew of other, much larger pigs with whom she would rather not associate and a variety of furred, feathered & scaled friends at the manor. In lieu of flowers, Gladys’ final wish was to have contributions sent to complete Chenoa Manor’s Tortorium project, as she found the tortoises lumbering about her pasture rather a nuisance and the parrots rather loud. She would very much like them to have their own place, far away from her earthly resting place.